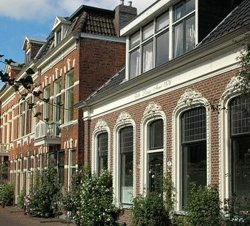 The low house prices in Zuidoost attract newcomers to the city. Around 130 countries are represented in the population of about 86,000. Nearly a third of all residents are under 21. Zuidoost has four residential areas, the most notorious being the Bijlmermeer. This neighbourhood has a lot of 1960s and 1970s apartment blocks built in accordance with the ideas of the great architect Le Corbusier about neighbourhood planning and low-income housing. His influence shows in the district’s stark, massive, near-identical apartment buildings. The Bijlmermeer’s builders planned for the complex to be a middle-class suburb, with plenty of spaces that would allow for the fostering of community spirit. Unfortunately, it has not turned out this way. Unable to attract the more well-off Dutch, the Bijlmermeer became a low-income, unsafe area with a high turnover of residents. Many are immigrants, and many are unemployed. There are some attractions in the area—a football stadium, some cinemas, even expensive office spaces have opened up nearby. There have been some efforts at rehabilitation and improvement, but the Bijlmermeer’s problems with safety and cleanliness remain, and it has not been able to shake off its negative reputation. It is also known for a tragic event—a jetliner crashed into a block of flats in 1992, killing 43 people.